Now that we've finished the alphabet, it's time to start over, but with a few changes. Instead of a big letter to go on Spencer's door, we will be making alphabet flashcards and an alphabet photobook. We'll also be doing other letter related projects during the week and sometimes field trips. The letter A was all about apples! I cut an apple in half and Spencer used those to stamp red and green paint onto a piece of paper and the upper and lower case letters cut out of cardboard for the Aa flashcard. 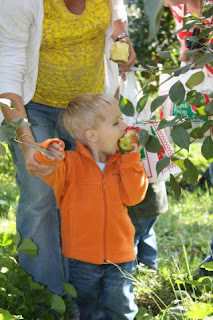 He didn't like this at first because he couldn't figure out a way to pick up the apple without getting his hands dirty. Once I told him it was okay to get dirty, he had fun with the project. We did a Peek-a-boo apple project. First Spencer painted a popsicle stick green to make the worm. Then we assembled the pieces I had cut out from a template. But he couldn't paint just a popsicle stick, so he painted a green and red picture as well. We also had apples for a snack. We took two field trips to an apple orchard this weekend as well. On Saturday we went with Grandma Amy, Ant Katie and cousins Samantha and Hunter. On Sunday we went with the Fravels, our good friends. 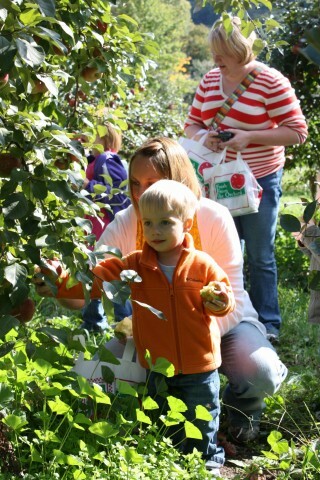 Spencer ate a lot of apples and was in tractor heaven! Day 1 of apple picking. Grandma Amy, cousins Samantha and Hunter. Day 2 of apple picking starts with a relaxing swing ride with Jackson. Mmmm, I'm still not sick of apples. What about this one, Mommy? And, finally, here is the first installation of the alphabet photobook. Y it's time for school already!